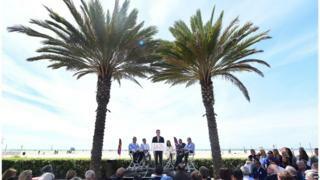 The US Olympic Committee (USOC) has named Los Angeles as the US bid for hosting the 2024 games. "This is a quest Los Angeles was made for," said LA mayor Eric Garcetti. "This city is the world's greatest stage." The bid sets out $6bn (£3.8bn) in proposed public and private spending. Los Angeles hosted the Olympics in 1932 and 1984, and if chosen would join London as another three-time-host city. It replaces Boston, which dropped out. Los Angeles City council voted 15-0 to allow Mr Garcetti to negotiate with the US Olympic Committee, effectively giving the city's Olympic ambitions its blessing. Boston had pulled out as the US candidate in July, after concerns that local funds would be used to pay for budget overruns. Image caption LA Mayor Eric Garcetti (centre) said the games would be "spectacular"
Mr Garcetti said LA would stage games both "spectacular" and "profitable." Much of the infrastructure needed for the games already exists in LA, but council members had to be reassured that the Games would not subject LA residents to unchecked spending or debt. Many conversations about the potential games' cost to LA are to come later, council members said. The host city will be chosen in 2017. Other cities being considered include Rome, Paris, Hamburg and Budapest. Atlanta held the last Summer Games in the US, in 1996. Salt Lake City, Utah, hosted the Winter Olympics in 2002.